Time for one more “Brief Talk”! Our blog is interviewing a model you have very recently seen posing for the debut of the new underwear brand Zphela: Andy Mendes. Andy is one more model to watch, we expect to see great things from this guy in the near future. Let’s find out what his favourite underwear brand is, the best moments of his career so far, where he sees himself in five years and many more in his interview below. Haha! Ok I’ll start off by letting you guys know I am a regular guy with the same daily struggles. I’m not your typical model/actor who needs the high maintenance, that’s the stereotype “Model” title. I love being connected with people and remaining down to earth. The closer I remain to the everyday community the better I feel, allowing me to stay motivated and set an example to the young generation. Since I take my health seriously. I Love to get asked about health tips, exercises, and routines. You may always reach out to me on Instagram or Twitter (links provided above). Besides my personality and my personal choice to live life from the mundane of the “Model” title. I was born in La Havana, Cuba on March 19 1988. Came to the U.S. at the age of 7 with my mother, my sister, and my late uncle. Martial arts was the only thing on my mind, I was completely convinced it was my passion. The spark of interest came to me after watching “Blood Sport”, I just knew right then Hayashi Ha Shito Ryu Kair and Karate-Do was my passion. This passion led me to plenty of achievements and opened doors I never expected. I was able to inspire so many other individuals, be a part of the USA team, and becoming world national champion! “You’re the looking version of Jacob”. I do have to say: being told I was the better looking version of Jacob from the twilight series topped it off. Yes! It did make me feel good, no matter how weird or unbelievable it may sound. Haha! All jokes aside. That’s when it really hit me to get some pictures done, besides the fact I always liked the camera and the camera flirted back. It was kind of meant to be. Haha! Sorry I couldn’t help myself! You can never take me too seriously all the time. My first photoshoot with “Jeff Thomas Schuller” which just confirmed I wanted to be In front of the camera. Being book for the pilot of “coconut wives” was such an experience. I saw a whole new side of the entertainment world. This opportunity opened the door for me to be featured in the music video “Rather Be Dreaming” by the talented “Margeaux Jordan”. If I had to choose the best moment, I believe working with “Zphela” would be it. The amount of work, effort, and love towards making an extraordinary underwear and lounge wear brand is beyond anything I had ever imagined. Work and personal life, are they hard to combine? When I started I believed everything would be tough. As I worked alongside the fashionably inspired side of the industry it was clear that this was meant to be. In truth; my lifestyle and work fit together perfectly. What tips would you give our readers to stay in great shape like yours? I won’t sit here and lie! You have to want it. If I say: “You can change the way you look if you do this!” That wouldn’t be true! The only way to get results is to really want it and then go get it. Even if it starts with a support group, as long as you take action it will change. Once you begin it’ll be difficult, but you’ll end making it a part of your daily life out of love for it! 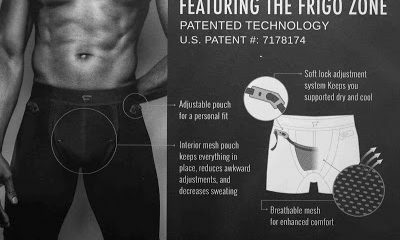 What is your favourite underwear style and brand? Favourite style, boxer briefs. Favourite brand, don’t laugh at me but besides Zphela I love Hanes hahahaha! They just feel right! I’ve tried other brands too, so it’s fair to say I also love Calvin Klein, Abercrombie & Fitch, Polo, Channel. On a billboard in New York, Miami, my hometown, or LA. I’d also love to see myself mentioned in organisations that take care and place kids in a good living environment.